Be sure to look for the pop-up book sale by donation of new and gently used books for adults, teens and children. Raffle tickets will be available for a lap quilt to be raffled off in mid-December. chili pepper and finished with coconut milk. Celery then add corn, potatoes and milk. onions, garlic, broth and cream. vinegar and dried mustard dressing. Your choice of coffee, tea, lemonade or milk. Apple Crisp and a gluten free version as well. 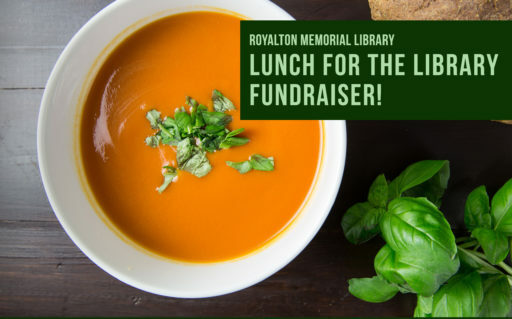 All proceeds go towards the continued capital campaign for the historic renovation and expansion of the Royalton Memorial Library.